In 404 B.C.E., at the end of the Peloponnesian War, Sparta emerged victorious as the most powerful city-state in Greece (Sacks, 1995, p. 230). Sparta was the only city-state to have a professional standing army in which the men devoted their entire lives to training to become killing machines. This also gave them the benefit of campaigning during the harvest time, as the other city-states often had “farmer-soldiers” that would need to return home (Sacks, 1995, p. 232). As a result, Sparta had the best army in all of Greece (for a few centuries). At the core of their fighting force were the heavily armored hoplites, named for the hefty hoplon shield they carried into battle. And nowhere was the shield more important than in Sparta. As the old Spartan proverb, “Return with your shield or upon it,” suggests, the shield was like a badge of honor, and to lose it would bring devastating disgrace (Sacks, 1995, p. 117-118). With their shield, set of bronze armor (called the panoply), and a 6-8 ft. spear for thrusting, the Spartans would march into battle in an “orderly, multiranked formation” known as the phalanx (Sacks, 1995, p. 118). As the image below shows, the soldiers would be standing closely together, ready to repel or charge into their enemies (Tungsten (Wikipedia), 2007). The illustration also reveals a weakness of the phalanx formation- an unprotected right flank, meaning that the soldiers weren’t just fighting for themselves, but for their vulnerable comrades. 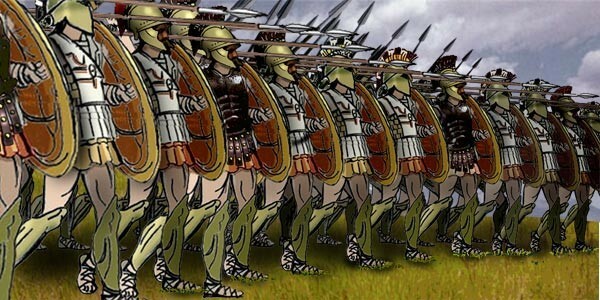 In this formation, the hoplites would have preferred to fight on level ground, as it would be a lot easier to keep ranks. And while the phalanx had a “natural function” of defense, the Spartans proved otherwise on more than one occasion (Sacks, 1995, p. 179). They often employed “co-ordinated mass infantry manoeuvres, in which eight-deep shield walls bulldozered the enemy off the field of battle or terrorized them into giving up and running away” (Cartledge, 2004, p. 32). This reputation seems to have preceded them when the peltasts (lightly armored, skirmisher troops) of Iphikrates “were so frightened of the Spartans that they would not approach within a spear-cast of the hoplites…” (Xenophon, 2009 Translation). Despite the fact that the Spartans were fierce opponents in battle, they weren’t unbeatable. In one case, during the battle of Koroneia in 394 B.C.E., it seems that “the Spartans deliberately marched head-on against the victorious Thebans, hoping to knock out their crack troops in a decisive second charge and thereby win the battle outright” (Hanson, 1988). While charging at someone that just defeated you sounds absurd, it shows the great determination of the Spartans at war; that whether they were winning or losing, they would keep fighting for the glory and honor of their people. The Spartans were without a doubt formidable adversaries, and while their traditional battle tactics later led to their downfall as a major military power, you have to admire their intense lifestyle and gutsy tactics on the battlefield. Cartledge, P. (2004). The Spartans: The World of the Warrior-Heroes of Ancient Greece. New York, NY: Vintage Books. Sacks, D. (1995). Hoplite; phalanx; Sparta. In A Dictionary of the Ancient Greek World (pp. 117-118; pp. 178-179; pp. 230-232). New York, NY: Oxford University Press. Xenophon. (2009). The Landmark Hellenika (J. Marincola, Trans.). New York, NY: Pantheon Books.